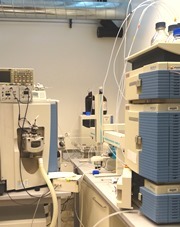 The Interdisciplinary Center in Mass Spectrometry at Lyon (CISMALY) is an open platform for research, service, consulting and training in mass spectrometry. CISMALY is hosted in the ISA’s buildings. Created by members of the units ILM and ISA, this platform is labelled and funded in part by the research federation “Institute of Chemistry of Lyon” (ICL). Research projects are oriented on instrumental and methodological development as well as on gas phase chemistry for the qualitative and quantitative analysis of biomolecules. In the frame of close partnerships with biomedical academic centers, programs on discovery and clinical evaluation of candidate biomarkers (proteins, metabolites), on metaproteomics and metabonomics are also handled with application to cancer, nutrition, cardiology and infection. CISMALY also provides consultancy, training and services with high added value in terms of exact mass measurement, high-speed analysis, development of validated methods and transfer methods. A Q-TOF (MicrOTOFQ II – Bruker) with 4 sources (ESI, APCI, DESI CSI) for MS or MS2 analyzes in high resolution and can be coupled to the HPLC.